For questions and assistance on orders. 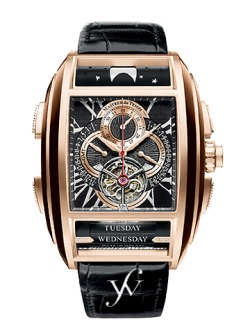 The Chapter One timepiece, was indeed a collaboration of giants in the watch industry. Each of the master watchmakers brings their unique strengths and expertise to the development of the timepiece. It is a world-first combination of complications crafted from 558 components. It is the first wristwatch to feature a tourbillon with mono-pusher column wheel chronograph, retrograde date, and retrograde GMT, as well as moon phase and day of the week on their own rolling bars. The two rollers work simultaneously with the time, date, GMT, and chronograph. The 18K red gold case is a large 62.60 mm x 45.90 mm and has a sapphire crystal with double anti-reflective coating. The watch comes on an alligator strap with 18K red gold deployant buckle. Functions: One-minute tourbillon, mono-pusher chronograph, retrograde date indicator, retrograde GMT indicator, day of the week indication on roller, patented precise moon phase indication on roller. Cartier was founded in Paris in 1847, known for creating jewelry masterpieces for kings and world leaders.